Hairy Mountain Folk: The book is here! 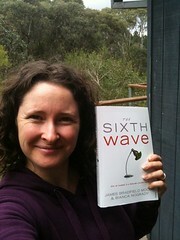 It's hard to believe, but after nearly 2 years of work, The Sixth Wave is finally published! It isn't due to be released in bookstores until the beginning of April, but I have in my hot little hands one of the first copies off the press. The website is also up at www.sixthwave.org.